For probably the first time ever, having scrawny legs is a plus! When I was taking these photos I thought, "Oh no! The horizontal lines on these leggings make my legs look big." But when I looked at the images I realized that when you've got skinny legs, horizontal lines aren't really a big deal. In fact, they probably help! I got this fabric from the bargain bin at my local fabric store. I love it. It's super warm and because of the awesome pattern I used, matching up the strips was beyond easy! I really love this pattern. It's beyond easy and takes less than an hour to cut and make. The seams are on the inner leg so you don't have to worry about matching on the outside. 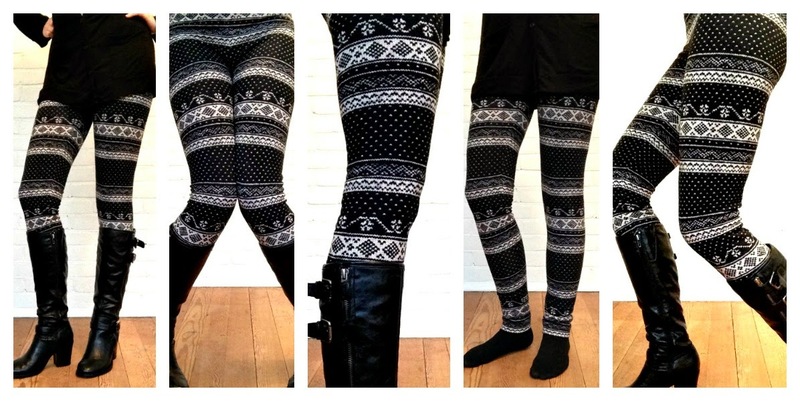 You might remember it from the first Winter leggings I made HERE and the batch of other leggings I made HERE. I made a matching pair of this Nordic version for my niece but sent them off to her before I remembered to take any pics. I have this pattern too, but still haven't used it - you've convinced me I need to get on it. Love all of yours! Thanks for linking to the Craftastic Monday party at Sew Can Do! lovely leggings! so awesome you made your own! I am off to check the other links :) have a warm week! Oh my gosh - you are adorable!